The example below may not match your screen exactly as options may be customized for your state. Click on an area of the Screenshot you have questions about! Call Frazer at 888-963-5369 if you have any questions! The due date will only advance if the customer pays at least this percentage of the current amount due. Force Payment to ALWAYS be applied to FEES first? Checking this box means that every time you take a payment on a customer with a FEES balance, a portion of that payment will satisfy that fees balance before the contract. A payment will always apply to the account balance rather than apply to fees on the account. Always advance the promise date into the future, even if due date is in the past. Checking this will always push a customer's promise date forward, even if they are past due. This is particularly helpful for managing collections in Frazer. If, after taking a payment, the customer's balance is less than this dollar amount indicated there, you will be prompted to forgive the balance. When you enter a payment, this requires you to tell Frazer how the payment was taken, by mail, phone, or in person. Click this button to begin the electronic payment processor setup, or to manage what's already set up. Selecting this option will set Frazer so that it uses Advanced Receipts, which offer more complex receipt customization options to you. This is the preferred way to print receipts in Frazer, and allows you to print to a receipt-style printer, in addition to a regular laser printer. Selecting this option will set Frazer to use our Classic Receipts, which you may be more used to if you've been using Frazer for a while. Clicking this button will allow you to reset the receipt numbers and start over counting up from any number you choose. Check this box if you'd like to choose each receipt number as you print them, instead of having Frazer choose them automatically. When this is checked, Frazer will prompt to print a receipt for both down payments and deposits when you click Complete as Sale on a deal. Make sure this box is checked if your deposits are refundable - Frazer will adjust your receipts accordingly. Checking this box will automatically close a customer file after you take a payment on it. This speeds up the taking of payments considerably. If this is checked, the Customer Activity window will pop back up after you close a customer file. This makes it much easier to access your customers. 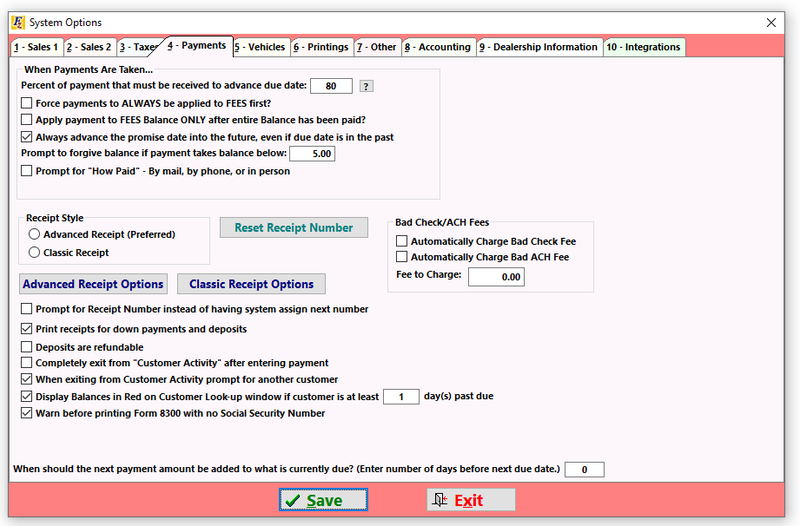 Late customers will have their balances in Red if they are later than this number of days. Top of Page. When this box is checked, you will be warned of a missing Social Security Number when you're prompted to print Form 8300. Occasionally you may record a payment via check or ACH that is returned for insufficient funds. You can back the payment out by recording a payment type of “Bad Check” in the customer’s account. If you charge a return check/ACH fee when this happens you can set your system to automatically apply a charge to the customers account. You can also set your default amount.